The first thing you notice about Edinburgh is its striking setting. 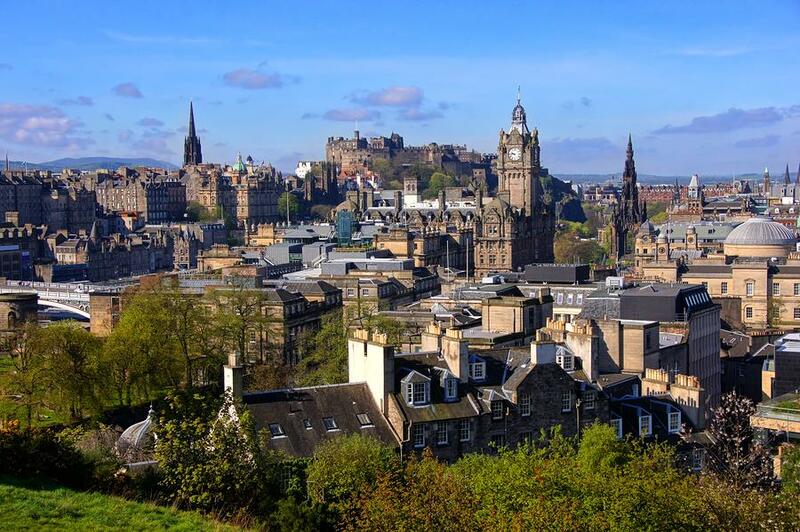 The city is perched on a series of extinct volcanoes and rocky crags that rise from the flat landscape of the Lothians, with the sheltered shoreline of the Firth of Forth to the north. The centre is clearly divided in two. The maze-like Old Town lies on and around the crag linking the castle and the Palace. Here you'll find the majority of the city's tourist sights. To the north, the dignified New Town is laid out in a symmetrical pattern during the Age of Reason. Although only about a mile long and 300 yards wide, with its narrow alleys and tightly packed closes, the Old Town has a distinct medieval feel. It was the underworld lore here that inspired Stevenson's Dr Jekyll and Mr Hyde. 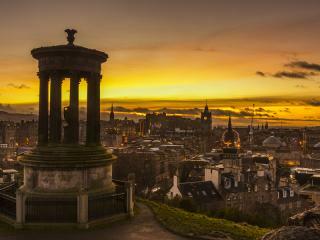 Even today, the Old Town remains at the heart of Edinburgh. Until 1707 Parliament House was the home of the Scottish Parliament. It is now the location of Scotland's highest Law Courts, and the nearby Assembly Hall, is the temporary home of the new Scottish Parliament. 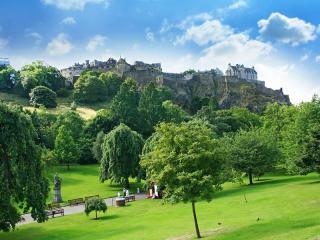 Edinburgh Castle dominates the city from its lofty seat atop an extinct volcanic rock. 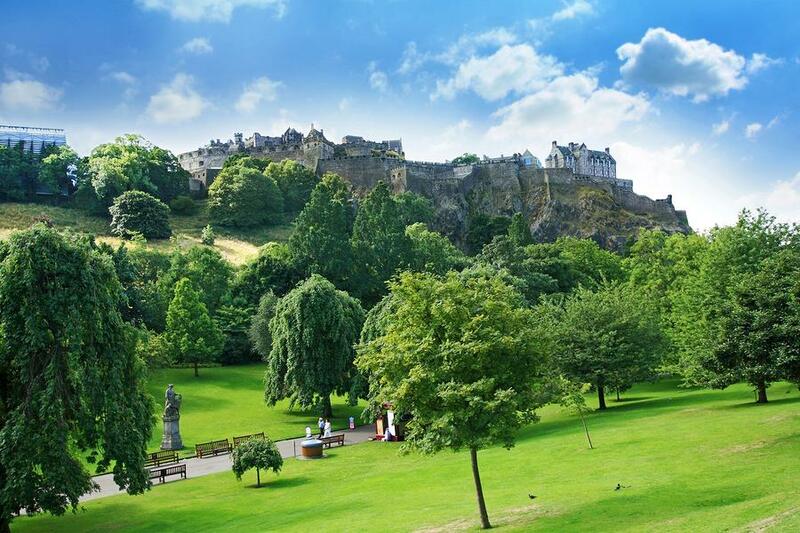 The history of Edinburgh, and indeed of Scotland, is bound up with its castle. Different architectural styles reflect its many changes in usage, as well as advances in military architecture. The oldest surviving part is the 12th century St Margaret's Chapel, while the most recent additions date back to the 1920s. Wind your way along the Royal Mile, losing yourself amongst a riddle of closes, vaults, tunnels and old-town tenements (though in summer it can uncomfortably crowded). Every day a blast of cannon is let loose from the castle. The Palace of Holyroodhouse is set on the crag which sweeps down from the towering fairytale castle. Founded as a monastery in 1128, the palace is The Queen's official residence in Scotland. Highlights include the royal apartments, with intricately carved plaster ceilings, floor-to-ceiling tapestries and mythological paintings. Immediately beyond the palace is Holyrood Park or Queen's Park - a natural wilderness in the very heart of the modern city. An amazing variety of landscapes including hills, crags, moorland, marshes, glens, lochs and fields give a glimpse of the wild beauty of Scotland's scenery. The park includes the peak of Arthur's Seat, the largest and most impressive of the volcanoes. 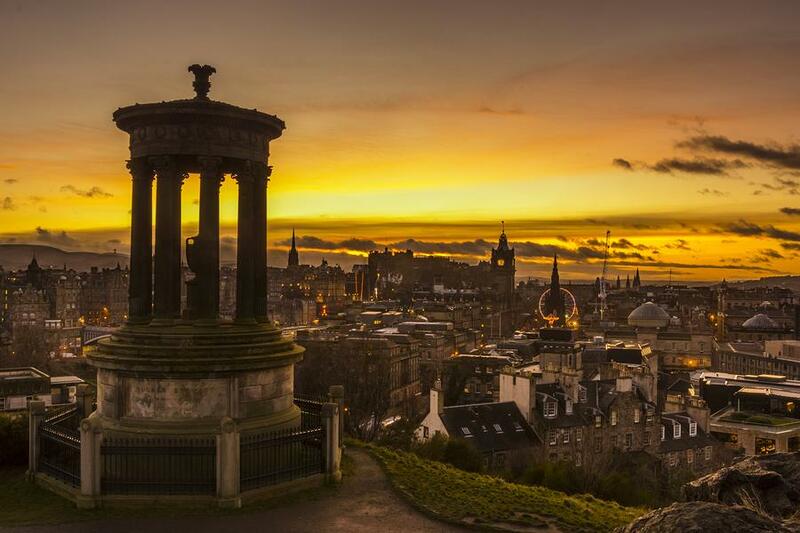 The Seat is Edinburgh's single most prominent landmark, resembling a huge crouched lion when seen from the west. South of the Royal Mile is the exciting new National Museum of Scotland. The museum houses thousands of Scotland's most precious artifacts and the elegant design of the building has also received well-deserved acclaim. It is considered Scotland's premier museum. Other museums well worth a visit are the National Gallery of Scotland and its offshoot, the Scottish National Gallery of Modern Art, containing two of Britain's finest collections of paintings. Beyond the city centre, the liveliest area is Leith, the city's medieval port. As Scotland's major east coast port, Leith played a key role in the nation's history, even serving as the seat of government for a time. Today the port boasts the best concentration of good restaurants (particularly seafood) and bars in Edinburgh. The dock areas are being transformed by Europe's largest ongoing waterfront development, including the new Ocean Terminal. The former royal yacht Britannia is located here and now open to visitors. If you don't like crowds, it's best to avoid the city in August and early September during the Edinburgh Festival. Around a million visitors flock here to attend a series of separate festivals that make up the largest arts extravaganza in the world. Every available performance space – from the grandest concert halls to pub courtyards – plays host to a packed programme of drama, comedy, performance, music and film. You need to book accommodation well in advance. 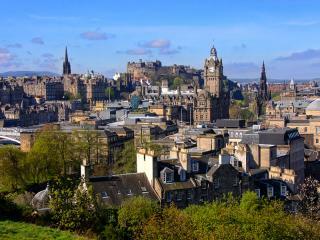 At any time of the year, Edinburgh has a youthful feel due to the presence of three universities and several colleges. You'll find a lively atmosphere in the cities distinctive howffs (pubs) and trendy modern bars, particularly in the Old Town. Edinburgh has a long history of brewing beer, though only two principal breweries remain: the giant Scottish & Newcastle (who produce McEwan's and Younger's) and the small independent Caledonian Brewery, which uses old techniques and equipment to produce some of the best beers in Britain. Traditional Scottish cooking (including haggis) can still be found at some of the more formal restaurants. However, many contemporary restaurants now offer "modern Scottish" cuisine which features top quality meat, game and fish. As with most large British cities, the culinary map of Edinburgh is very global, with long-established Chinese, Indian and Mexican places competing with new outlets for Thai, Japanese, North African and Spanish cuisine.